Facts about Silverfish Insects, "Scientific name for Silverfish insect is Lepisma saccharina", given in 1758 and also known as the or fishmoth insect. The Silverfish Insect are part of the Lepismatidae family. These small, wingless insects are light grey or blue with a metallic shine, though the young are off-white. The Silverfish Insect have two very long antennae on their head, six legs, a long tail and spikes on the tail. The constant wiggling of their bodies resembles the movements of a fish. The Silverfish Bug are half an inch to an inch long (1.2 to 2.5 cm). The Silverfish Insect live two to eight years in the wild if not eaten first. Silverfish Insect are nocturnal. The Silverfish Insect have compound eyes. They need high humidity, between 75% and 95%. This is why the Silverfish Insect are often found in leaky basements, around toilets, under sinks and around showers. The first sign of an infestation is sometimes a live one found in the bath tub or sink. The insect family is found in Africa, the Americas, Australia and Europe. Silverfish Insect are traced back to some of the most primitive insects that appeared around 300 million years ago. The jumping bristletails they have (spines on their ends) leave distinctive tracks, some of which have been dated to 400 million years ago. Lepisma saccharina, the Silverfish Insect, eat carbohydrates like sugars and starches, eating leftover food or cereals. Silverfish Insect may contaminate food, but they do not spread diseases that are a hazard to humans like flies. This is fortunate since the Silverfish Insect even made their way into unopened food packages, having eaten through the cellulose and then the plastic bag to get to the rice or cereal. The Silverfish Insect will eat the starches and glues in books, paper, plaster, tapestries, cotton clothing, silk, wallpaper, human skin flakes, some types of carpet and other items. They are known to damage books and stored paper. The Silverfish Insect will sometimes eat their own exoskeletons and other dead insects. Silverfish Insect sometimes eat leather if starving, but this is rare since they can live up to a year without eating. As they feed, the Silverfish Insect leave pepper-like feces. Silverfish Insect do not bite humans. Silverfish Insect have a multi-stage courtship ritual. After the ritual, the male lays his sperm capsule which the female takes into her body to fertilize the eggs. The female Silverfish Insect lays groups of eggs in side of a crevice. The number of eggs laid varies on the species of Silverfish Insect, but rages from two to twenty per laying. The eggs take two to eight weeks to hatch. Young Silverfish Insect are white but otherwise look like small adults. They will molt twenty to sixty times as they reach their adult size, far more than average. Unlike many insects, Silverfish adult insects also molt. Silverfish Insect are eaten by spiders, centipedes and earwigs. 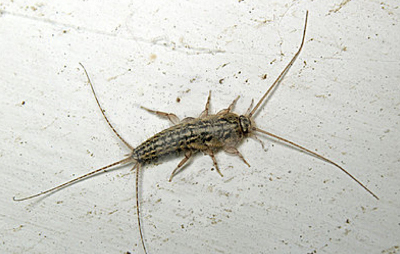 The firebrat is sometimes mistaken for the Silverfish Insect. The firebrat or Thermobia domestica is smaller than a Silverfish Insect, and it has darker markings. You can control Silverfish Insect by controlling humidity. In crawl spaces, open vents and basements, use baseboards that have caulking. Limit the number of potential feeding sites and store food in containers the Silverfish Insect can’t enter like plastic Tupperware with lids or glass jars. Cinnamon will repel them but not kill them. You may want to put a dehumidifier in infested areas, eliminate standing water and fix leaky plumbing.